I highly value the Fi Sabilillah principle and I often quote it to myself. Here's the other thing. I'm a Muslim workaholic who gets paid by non-Muslims. 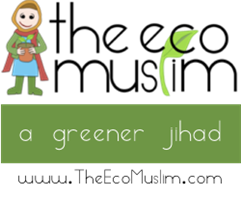 I'm a female Muslim workaholic, with family to support, da`wah organisations to support, and a community to support. I wouldn't want to be a Muslim who abused the Fi Sabilillah principle. But sometimes we all do. Why? So, here's the Fi Sabilillah deal-maker or breaker. You'll find this card-deal surfacing more so with brothers as they are often in leadership roles (we all know women are the backbones to projects!) A brother will watch a talented sister closely, inspecting her work, drive and attitude and consequently develop what I like to call 'leech-on' behaviour. He wants what she has to offer insha'Allah, in terms of free efforts and an exploiting of her talents. We must accept that nothing is free; all of our productive work dedicated to Islam is rewarded with du`a from peers (supplications), barakah (blessings) and `ajr (a wage/reward) from Allah. But rather than lay down a plan with goals, or, heaven forbid, ask the sister for her terms and fee rates, this dude pulls out The Fi Sabilillah Card (TFSC) from deep within his beard and demands that all her contributions to his holy cause be for godly compensation. How can you say no to God? "Sister! Ya ukhti! You are so talented; your work is excellent, you give such positive vibes, you have great impact, you're dedicated and you always produce high quality products/ideas/documents/presentations..."
This is flattery, he's not mentioning anything tangible, and it's a violation of personal "verbal" barriers. I for one do not hold respect for a sweet-talking Muslim man, yet this tends to be part of the Fi Sabilillah package, oh, and generous condemnation where one Muslim tuts and curses another Muslim for their "obvious neglect for the ummah"; two extremes. Throw dust in his (or her) face. "If only you were put to even better use! You're being wasted here!" Recognise this as a backhanded compliment since he's suggesting you stop doing what you do. Not only has he undermined your 'high quality' work, he thinks it needs improving and so, opens a door to his own purposes. The what and where come next. He'll probably want your time which you forget is the most valuable resource to you. Be careful in where you spend your time - you are allowed to say "No, I'm sorry, I don't have the time, masha'allah qadr'Allah." "I have a project that you should be a part of -or- I'm with a da`wah organisation that needs people like you." This is evangelical advertising. Is the request to self-promote or to filter actual skills for the betterment of all people? Of course this is a legitimate question and we can never judge intentions, or for that matter, infer they have a selfish goal. It is the method and purpose for which we work that we need to critique to keep in check. Too many da`ees, not enough doers. In my own personal opinion there are too many da`wah organisations and not enough people who "do". I can name 30, 40, 50 organisations in the UK alhamdulillah that work with just Muslim youth, in education, delinquent behaviour and developing key skills. Most of these are organised by Muslim women who already have responsibilities, raising young Muslims. Where are the Muslim men? On a salesmanship training program. Exactly. If, as a Muslim, you see individuals who do "do", meaning, they're already involved with community work (or have full time jobs), avoid pulling them away from something they probably love, or ASK them whether they can take on extra work and would like to volunteer for other programs. Even better, ask them how you can support their work. "But sister! Astaghfirullah, this is for the sake of Allah! Can you not do this immense amount of paper work and Microsoft-Macbooking and contribute to our 12 branches across the UK Fi Sabilillah?!" You have my permission to thwack him... No, don't do that. This is unfortunately how The Fi Sabilillah Card (TFSC) is used. The good brother does not, or cannot, compensate you or he thinks you're a robot-worker, so to avoid the "how much do you charge?" conversation he sanctifies his plea by attributing it to Allah subhanahu wa ta`la. This is fine, this is cool, we can work around it. Sometimes, we can't. As Muslim women, we certainly can't. Why? Because we're wives, mothers, daughters, sisters, life-coaches, teachers, Qur'an-tutors and counsellors. That's what the brother doesn't get - women are natural workers, men are natural leaders - swap roles for a week and watch the mess we get ourselves into. What this brother is asking is that we do his work for the sake of Allah AND with our hijabs pulled over our eyes. Granted, our lives, belongings and our families are not "ours". They were given to us as a keepsakes by Allah, and they should all return to Allah in the same state. As Muslims this is how we think - higher, differently - we do not have real ownership and this is why you'll hear of women who support their husbands' second marriages to protect other women "Fi Sabilillah". And you'll hear of young brothers who give their entire life savings to sponsor scholarship programs "Fi Sabilillah" so underpivileged children can go to school. And we all can turn the most mundane of tasks such as donating every week to a soup kitchen into a glorified act of worship that really is "Fi Sabilillah". But we weren't coerced into this, we did it sincerely, we weren't guilt-tripped into it, and we didn't stamp it with a gigantic TFSC stamp for others to photocopy! Compare Muslim organisations to non-Muslim organisations that function in a similar way: people are assigned roles according to their ability, plans are agreed upon and set, meetings are made, there is an end goal and there is a huge marketing and financial department. The latter two are what we Muslims skimp on. Marketing? I'm sorry, but this is not limited to shameless internet promotion, albeit, internet networking is not a bad thing. It's simply limiting. 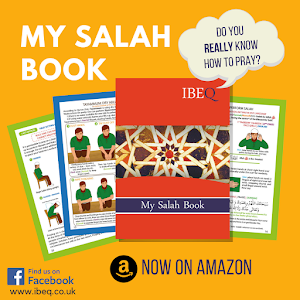 Real life projects and real life da`wah happens OFFLINE - this is where the Fi Sabilillah principle comes into beneficial action most often, behind the scenes. Marketing involves qualified media nerds who can design and fine tune branding for varied audiences. These nerds get paid. Ching-ching. What about finances? 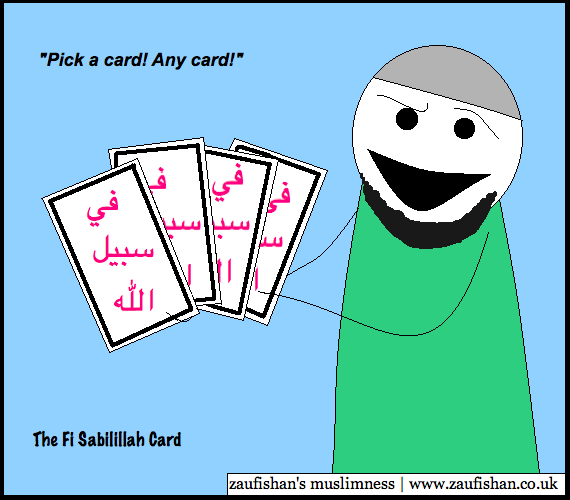 Ah, you mean the Fi Sabilillah Card? No. The idea that "all da`wah is free Fi Sabilillah and all provisions and team effort come from up above Fi Sabililah", is very true, but only one side to The Fi Sabilillah Card. Flip it over and you find that someone had to pay the annual budget. As Muslims we don't like talking about budgets, fees and fundraising. We're that cheap. Put that in your sheeshah and smoke it. Mark my words that for every single da`wah organisation, a non-Muslim accountant is tilling the costs for last year's bake sale, conferences, printing and video equipment. For every Islamic Society and Muslim Student Association, outsiders, in addition to the very students, are working extra shifts to cover the expenditure on fliers and food. For every Muslim website, a company is getting paid to maintain it and for every Muslim professional, a manager is getting a bill. We are paying to maintain our lives, with our lives, for the sake of Allah. But if we have no problem paying the non-Muslim organisation and receiving a catering bill, why do we skimp out with our own community? "They" will say because 'that is dunya work, this is deeny work'. No. There's no difference in a Muslim's work, all of what we do is for Allah, in fact it's bad Muslim character to close our hands to our own Ummah - if we expect them to support us, how are we supporting them? I'll say it again, it's because WE ARE CHEAP. We don't want to pay towards other Muslim efforts since we think that because we're all Muslim we are somehow thinking the same, and all our work is "Islamic", that is, it's too religious to be charged. We negotiate with our Muslim companies, but we pay our non-Muslim companies in advance, and tip them. I sometimes prefer the non-Muslim managers because they will say upfront, 'this is how much we'll pay you for your work', they don't pretend, there's no sweet-talking or holy card involved. May you live with The Fi Sablillah Card actively, as a manner, not as a veto flag. I am not intending to mock charity and work that is dedicated to Allah; I am asking us to recheck our intentions and approach. Commit to your projects and team whole-heartedly just as you entered Islam whole-heartedly. Avoid using The Fi Sabilillah Card on others, only apply it to yourself. If I ask another to commit to a project for the sake of Allah is it because I value their work - and will therefore compensate them appropriately - or because I know I can't afford someone equally qualified? Am I the effective Muslim leader working alongside my team or am I the recruitment manager handing out Discounted Tickets To God's Paradise? May Allah bless you and protect you from Shaytaan, and forgive us for the stupid things we do. I hope this gets around. Down with those card flashers! This was pure awesomeness! I agree with Sr. Azra - hope it makes the rounds! As always, very educational and beneficial. Jazak'Allahu Khairan. Much respect sista'. Keep doin' what your doin'! In retrospect, this sounds bitter and against varied 'groups' of Muslims. I stand by my argument but I hope we're not gon' start bashing our community's projects! We're all victim to the FS Card flashers and probably prone to flashing it ourselves. Mefeels it all goes back to check our own intention. Eckh, be warned! completely agree with this - i guess it hits a chord particularly as this has happened to me recently, with taking pictures for a number of events... also agree with your comment, though - we all do it, and it does depend on intentions. keep ranting, keep writing!